Dubai: A heavy thunderstorm hit Abu Dhabi city and the Western region on Sunday night and again on Monday morning, bringing in the unstable weather to Dubai and various areas across the UAE. Dark rain clouds enveloped Abu Dhabi and the Al Dhafra region as rainfall pounded against vehicles and roads, leading police to issue an alert to drive safe and cautiously during the unstable weather. 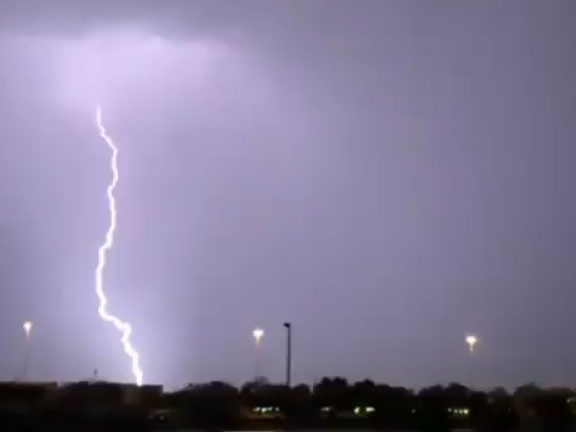 A video of Monday’s lightning storm in Abu Dhabi was posted on the UAE Storm Centre’s Instagram account. The convective clouds moved on to Al Ain and Dubai and brought in further rainfall while surprised motorists found themselves in the midst of April showers. Light showers eventually made their way to Al Bateen Airport in Abu Dhabi and Sharjah. The National Centre of Meteorology (NCM) said that the weather will be cloudy in general, with some rainfall over scattered areas. Moderate to strong southeasterly to northeasterly winds will blow dust over exposed areas, reaching speeds of 2-30 km/h and up to 40 km/h at times. The NCM also posted a video of wet roads in Saih Shuaib. Minimum temperatures are expected to range from 23-27 °C and highs of 34-39 °C in coastal areas, while the mountain areas will have a minimum temperature of 18 °C and highs of 28 °C. In internal areas, the temperature will reach a maximum of 41 °C with lows of 23 °C. Residents can expect the cloudy weather to continue on Tuesday with the chance of scattered showers on the western and coastal areas, which will bring in thunderstorms and a fall in temperatures by Wednesday. “Partly cloudy to cloudy at times over some areas with a chance of rainfall with thunder at times, especially over western and coastal areas at different periods, with a decrease in temperatures,” said the NCM. On Thursday, strong winds will kick up dust and sand at speeds of 25-35 km/h, and “the occasional bouts of rain and thunder will affect various regions of the country,” said the NCM.